SVFC’s Quiz Night fundraiser is coming up. Please support the event by booking a table! These nights are always great fun. Plenty of prizes and auction items on offer! Please contact the club on 9296 4436 to find out how to get your tickets! 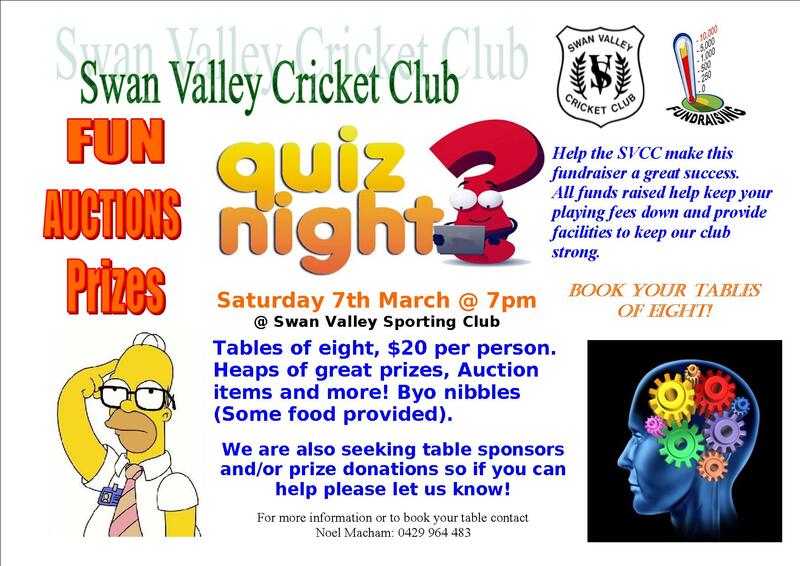 Swan Valley Cricket Club’s biggest fundraiser of the season is back again with the Quiz night on Saturday 20th February at 7.30pm. Details below. Hope to see you there!!! Swan Valley Cricket Club Fund Raiser – Quiz Night! Our major fundraising event for each season is always the ever enjoyable Quiz Night and we know this one will surely be as big or bigger than ever. Organise your tables of eight for $20 per person and tune your brain-cells as we journey towards intellectual enlightenment! Saturday 7th March 2015 at the Swan Valley Sporting Club starting at 7pm. Some light food provided (bring your own if you desire). We are also seeking help from businesses with table sponsorships ($180.00 + GST per table) and prize donations (goods, vouchers, etc). Any help will be hugely appreciated!